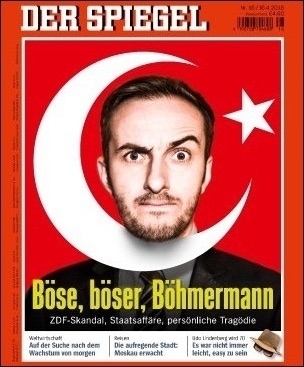 Comedian Jan Böhmermann is being prosecuted in Germany for reading a disparaging poem about Turkish President Recep Tayyip Erdogan. The always angry Recep Tayyip Erdogan, Turkey's president, should have a moment of peace and wonder why is he probably the world's most insulted president. Since Erdogan was elected president in August 2014 he has sued at least 1,845 people for insulting him. Now his judicial challenges have been exported to Europe. An obscure German law, dating back to 1871, was used to silence Iranian dissidents critical of Iran's Shah Mohammed Reza Pahlavi and Chilean dictator Augusto Pinochet in the 1960s and 1970s. Now Erdogan has become the third foreign leader taking advantage of that law after a popular German comic satirized him in crude terms. The law allows prosecution in Germany for insulting a foreign leader, but only with the consent of the government. German Chancellor Angela Merkel granted her consent for the prosecution of German comedian Jan Böhmermann for insulting Erdogan, although she promised that the law allowing legal proceedings would be repealed in 2018. All that would be a story of no importance in Turkey, where journalists tend to weigh their words more carefully these days, several newspapers have been seized or closed in recent months, broadcasters are being taken off the air, and prominent journalists are getting prosecuted on charges of insult, for being members of terrorist organization, or even for being spies. But Merkel's decision to allow Böhmermann's prosecution hardly complies with the European culture of civil liberties. Rebecca Harms, co-chair of the Group of the Greens/European Free Alliance at the European Parliament (EP), said that "[after Merkel's go-ahead for legal proceedings] now the Turkish journalists and artists will even suffer more." Merkel's support for Erdogan's increasingly prickly psyche came after two important reports highlighted Turkey's disturbingly autocratic regime. From across the Atlantic, the Country Reports on Human Rights Practices, released annually by the U.S. Department of State, provided a clear snapshot of the deteriorating human rights violations in Turkey. It said that the ruling Justice and Development Party (AKP) government's interference with freedom of expression, arbitrary application of laws, and inadequate protection of civilians in the country's southeast pose great threats to civil rights and liberties. The report also observed that: "Impunity and weak administration of justice is another issue of concern, as certain laws were applied too broadly and inconsistently ... Wide leeway granted to prosecutors and judges contributed to politically motivated investigations." 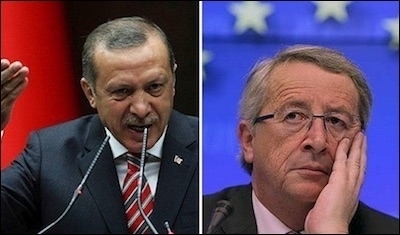 Turkish President Recep Tayyip Erdogan (left) has boasted that he is proud of blackmailing EU leaders, including European Commission President Jean-Claude Juncker (right), into paying him protection money. Back in the Old Continent, the European Parliament issued sharp criticisms of Turkey and warned in plain language that the European Union candidate country was "backsliding" on democracy, human rights and the rule of law. EP Rapporteur Kati Piri said after the annual progress report on Turkey: "The overall pace of reforms in Turkey has not only slowed down but in some key areas, such as freedom of expression and the independence of the judiciary, there has been a regression, which is particularly worrying." Erdogan is holding Europe's leaders hostage by threatening to scrap a recent Turkey-EU refugee deal. Under this agreement Turkey has committed itself to take back tens of thousands of refugees in return for EU cash, promises to make progress in Turkey's accession talks and visa-free travel for Turks visiting EU's Schengen zone. And we cannot just say, we now have the migration crisis so we don't discuss all the other issues. This is the signal the European Parliament wants to send with this report. With Turkey as a candidate country, we will also have to look at the internal developments and openly discuss it with the government. European leaders will need better diplomatic skills in their increasingly difficult balancing act between the reflections of Erdogan's autocracy in their own countries and their need for Turkey's help in containing the continent's worst ever refugee crisis. The trouble is, the more Erdogan realizes that his blackmailing works, the more willing he will be to export his poor democratic culture into Europe. Merkel has set the wrong precedent and given the prickly sultan what he wants.